Oldest son of Julius Goethe and his wife Ottillie. Johann Wolfgang Goethe was his grandfather. His mother was convinced of his musical talents and against the advice of friends she sent him to Leipzig to study with Felix Mendelsshon-Bartholdy. Mendelssohn made clear that it wouldn't do and this destroued his friendship with Ottillie. He was sent to other teachers in Vienna and also went to Robert Schumann, but had to give up his musical aspirations. He tried his hand at writing, but only 163 copies were sold of his first collection of stories. He protected Goethe's belongings in Weimar before they came into public hands after his death. Like his brother Wolfgang he never married. 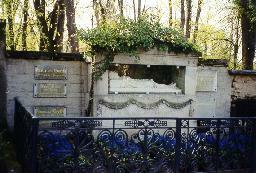 The graves of the Goethe family at the Friedhof vor dem Frauentor, Weimar.